Choose one of the following demo to discover their functionalities. You will be able to create a free demo sandbox. This plugin provide an input box to filter a specified DOM selector (like `.products li` or `item`) and hide those who does not contain the inputed text. User start writing into the input box and the plugin start filtering the DOM elements, hiding those who does not contain filter text. Filtering can be done with preset words buttons which fill automatically the filter with customized words. The plugin work with a shortcode which let the user customize pratically all the parameters. It is possible to integrate the filter into the Woocommerce product page: in this case the customization can be made via configuration page. 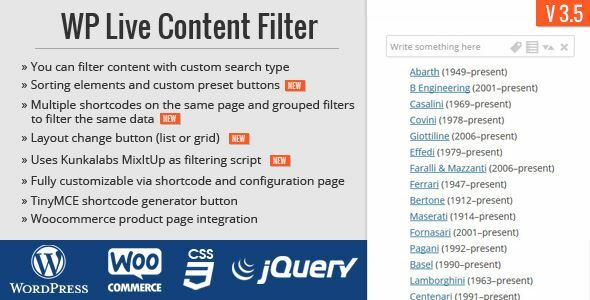 In addition the plugin let you order the filtered element in ascendig or descending order the filtered resulting elements and change the layout (list or grid) of the elements. Customizations of the filter box appearance and the animation parameters can be done from configuration page. You can load your 3D models (in STL format) into WordPress media. Camera auto rotation button let you star the rotation around Y-axis of the camera. By using the plugin shortcode generator, you can embed the thingviewer into you pages or posts. In the thingviewer you can pan, rotate and zoom the camera (with mouse or with keyboard). Help window button to display the mouse and keyboard commands to operate the thingviewer. Info window button display some useful information about the loaded model, like surface are, volume, bounding box. Fullscreen button let you switch to fullscreen mode. You can go back to the "windowed" mode by clicking on the "close" button. Bounding box button display around the loaded model a wireframe bounding box.